I saw a picture of the cuties floating around the old Facebook news feed a month or two back and just couldn’t resist not making them. I even went out and bought a teddy bear shaped cookie cutter! I’ve just used a basic plain cookie recipe for these bears, and went for a handful of almonds as my choice of nuts. Preheat oven to 160ºC and line three baking trays. Beat together using an electric mixer the butter, sugar, and vanilla until pale and creamy. Mix in the eggs and sifted flour, beating until combined. With some extra flour dust a bench top and roll the cookie dough out with a rolling pin, until about 1-2cm thick. 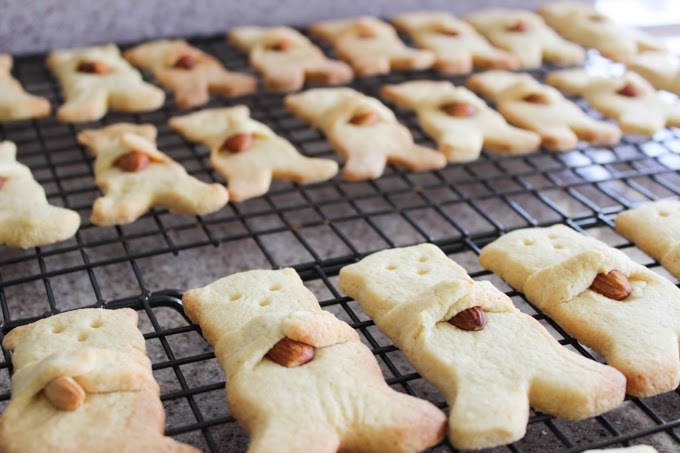 Once cut out with your teddy bear shaped cookie cutter, indent two eyes and a nose with a skewer, and place any nut of your choice on the bear’s chest and wraps it’s arms around it. Bake in the oven at 160ºC for around 12-15 minutes or until lightly golden. These cuddly bears are so perfect for those nights when you just want to cuddle up and watch a cute rom-com with a million and one blankets and a cup of hot coco – enjoy! A twenty-something blogger from Perth, Western Australia. Cat Mum to Leo and Ace. Lover of activewear, essential oils and champagne.